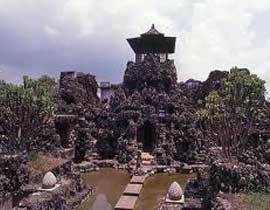 Tamansari Sunyaragi Cave Castle is one example of the ancestral culture of Indonesia. Likewise, the sophistication of its architecture is not lost with the creation of the people of today. Unfortunately, it had faded portrait of admiration because there is no serious treatment. Is this the mirrors of our nation personality? Construction and composition of building this site is a water park. Of the existing remnants, visible results of cultural sophistication and uniqueness of human beings in its day. And it should be, it can still be seen up to now if there is no interference and periodic maintenance. Sunyaragi Park comes from the word "Sunya" which means quiet and "leaven" which means the body or bodies. This park is in power Kasepuhan Palace. Although their functions vary according to the will of the ruler of his day, largely Sunyaragi Park is the park where the princes palace and palace soldiers imprisoned for improving science kanuragan. Sunyaragi Park consists of 12 sections: (1) jinem ward, where the sultan to give advice and see the soldiers practice, (2) bodyguard cave, a gathering place for the guards of the sultan; (3) complex Mande Kemasan (partly destroyed), (4) cave Pandekemasang , where a sharp weapon, (5) Simanyang cave, where the checkpoint, (6) Langse cave, a place to relax; (7) peteng cave, where Nyepi for immune; (8) Arga stagnant cave, where the important palace; ( 9) Padang Ati cave, where meditated; (10) cave permanence, lasting place of meditation for the position; (11) Lava caves, bat a special place; (12) cave Pawon, kitchen food storage. Observing Sunyaragi, we could see history in accordance with its time series. From the research data, showing the uniqueness of its construction, each period there is always a change in shape according to personal taste and needs of the ruling sultan. It is also concerned with the function of this place. Eventually, Castle Cave Sunyaragi doubles. Not only used as Pesanggrahan only, but also for the political activities of resistance. Symbol of resistance can be seen in the reign of Sultan Matangaji Tajul Arifin, this place used as a place to manufacture weapons and military training center if the kingdom. 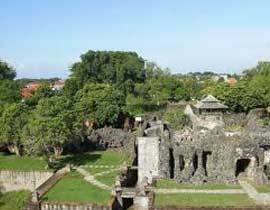 That is why, in the reign of Sultan Adiwijaya in 1852, Castle Cave Sunyaragi undergoing renovations, having previously destroyed by the Dutch. To repair it, the Emperor of China commissioned the architect. That said, the architect was held captive and killed for the secret cave Sunyaragi not leak into the hands of the Dutch. Khong and Sam Pho Chay Jin Tia is also often linked with the legend Sunyaragi. Moreover, this complex also keep proof of any sites that were given peg "Tombs of China". Nearby there is an old banyan tree has hundreds of years. Because of his parents, a few stalks need to be propped up with concrete poles and iron. Cave Castle Restoration Sunyaragi ever undertaken by the Dutch colonial government in 1937-1938. Implementation was left to an officer of the Cultural Department of Semarang. His name, Krisjman. He only strengthen the construction of the original by adding poles or brick pillar reinforcement, especially on the roof of the arch. But sometimes it also eliminates its original form, if the whole building is considered dangerous. As shown in Cave Guards and right-left wing of the building and Mande Jinem shard. Final restoration done Protection and Development Directorate of History and Antiquities, Directorate General of Culture, who restored the Castle as a whole from 1976 to 1984. Since it no longer exists a serious maintenance activities at this complex. When traced, the water park complex was born through a very long process. This place several times revamp and repair. According to the book Purwaka Carabuna Nagari work Aryan Prince Carbon, Sunyaragi Cave Castle was built in 1703 AD by Prince Kararangen. Prince Kararangen is another name of Aryan Prince Carbon. At Castle Cave there is a garden candrasengkala Sunyaragi called "Park Bujengin Obahing Earth" which refers to the number in 1529. In both places there are also similarities, that there are gate "Temple Bentar" the same great shape and one priority. Explained, Prince Kararangen only build complex Arga Jumut Cave and Mande Packaging only.